U.N. Secretary-General Ban Ki-moon entered the war-battered Gaza Strip on Tuesday to assess the damage following Israel’s three-week long bombardment. Rebuilding the thousands of homes and buildings damaged or destroyed in the Gaza Strip during the three-week conflict will cost billions, the UN has said. Ban met with Israeli Prime Minister Olmert earlier today. Prime Minister Ehud Olmert on Tuesday said that Hamas was fully responsible for the damage caused during Israel’s 22-day offensive in Gaza and must not be allowed to lead reconstruction efforts. “Hamas bears full responsibility for the destruction in the Gaza Strip and the harm to innocents, therefore, Hamas must not be allowed to lead the reconstruction process in the Strip and receive any kind of legitimacy from this,” Olmert told visiting Italian Foreign Minister Franco Frattini. UN Secretary-General Ban Ki-moon says he is appalled by Israeli attacks on a UN compound in Gaza after seeing the destruction for himself. Mr Ban said that those responsible should be held accountable and demanded a “full investigation” through proper judiciary systems. He was speaking in front of the smouldering remains of the UN food warehouse destroyed by Israeli shells. He said he would do all he could to help the population of Gaza. Appearing stern and at times angry, Mr Ban called the attacks “outrageous” and demanded guarantees that it would never happen again. Residents of the Gaza Strip have taken their first close look at the large-scale destruction across their crowded territory. First estimates by independent surveyors said Gaza lost nearly $2 billion in assets during Israel’s three-week war on Hamas, including 4,100 homes, about 1,500 factories and workshops, 20 mosques, 31 security compounds and 10 water or sewage lines. Tens of thousands of Palestinians have been left homeless and 400,000 people still have no running water, a UN report said. 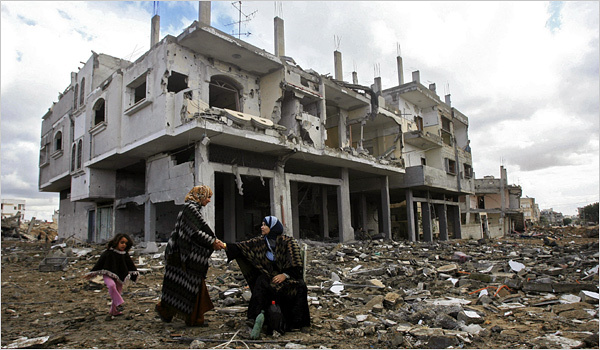 UN Secretary General Ban Ki-moon will visit Gaza on Tuesday to inspect the damage. A fragile ceasefire between Israel and Hamas militants is holding, allowing many Palestinians to return home to assess the damage. Many Gazans seemed overwhelmed, saying they didn’t even know where to start with the cleanup. The return of civilians comes as Hamas declared victory over Israel but the Islamic group vowed to replenish its arms stockpiles in the wake of the 22-day onslaught on Gaza. Ismail Haniya, the deposed Palestinian prime minister and political leader in Gaza, said the “armed resistance” had triumphed by surviving the Israeli operation. THE recent death and destruction in Mumbai, India, brought to my mind the death and destruction in Karachi on Oct. 18, 2007, when terrorists attacked a festive homecoming rally for my wife, Benazir Bhutto. Nearly 150 Pakistanis were killed and more than 450 were injured. The terrorist attacks in Mumbai may be a news story for most of the world. For me it is a painful reality of shared experience. Having seen my wife escape death by a hairbreadth on that day in Karachi, I lost her in a second, unfortunately successful, attempt two months later. The Mumbai attacks were directed not only at India but also at Pakistan’s new democratic government and the peace process with India that we have initiated. Supporters of authoritarianism in Pakistan and non-state actors with a vested interest in perpetuating conflict do not want change in Pakistan to take root. To foil the designs of the terrorists, the two great nations of Pakistan and India, born together from the same revolution and mandate in 1947, must continue to move forward with the peace process. Pakistan is shocked at the terrorist attacks in Mumbai. We can identify with India’s pain. I am especially empathetic. I feel this pain every time I look into the eyes of my children. Pakistan is committed to the pursuit, arrest, trial and punishment of anyone involved in these heinous attacks. But we caution against hasty judgments and inflammatory statements. As was demonstrated in Sunday’s raids, which resulted in the arrest of militants, Pakistan will take action against the non-state actors found within our territory, treating them as criminals, terrorists and murderers. Not only are the terrorists not linked to the government of Pakistan in any way, we are their targets and we continue to be their victims. India is a mature nation and a stable democracy. Pakistanis appreciate India’s democratic contributions. But as rage fueled by the Mumbai attacks catches on, Indians must pause…. You are currently browsing the archives for the destruction category.